We’re on a pizza kick. Got some pizza dough? 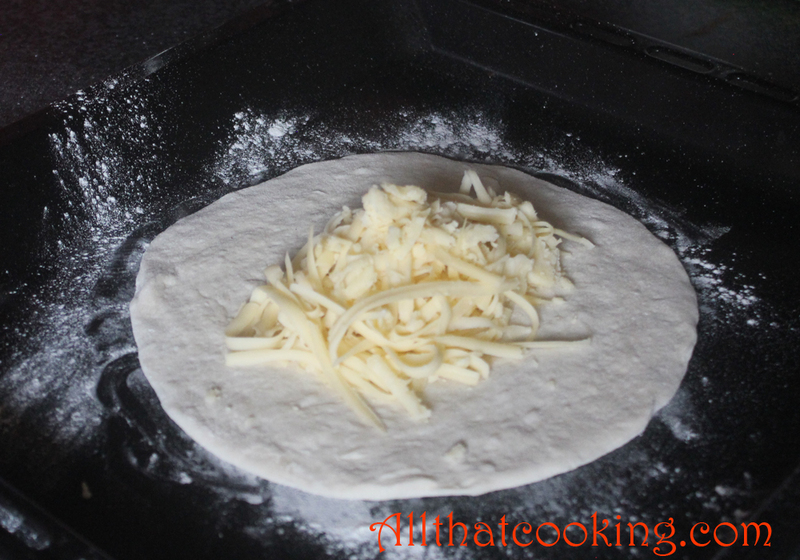 Why not make some calzones? 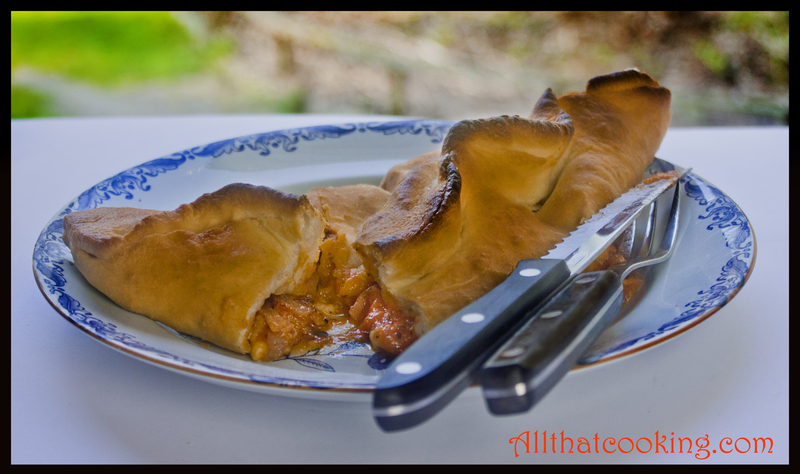 “Calzone” means pocket in Italian and these half moon stuffed pockets are great portable grab and go snacks or lunches. Serve them up with a salad and a glass of red, take it al fresco and you’ve got a lovely summer evening dinner. Start by making the pizza dough and gather the stuffing ingredients. 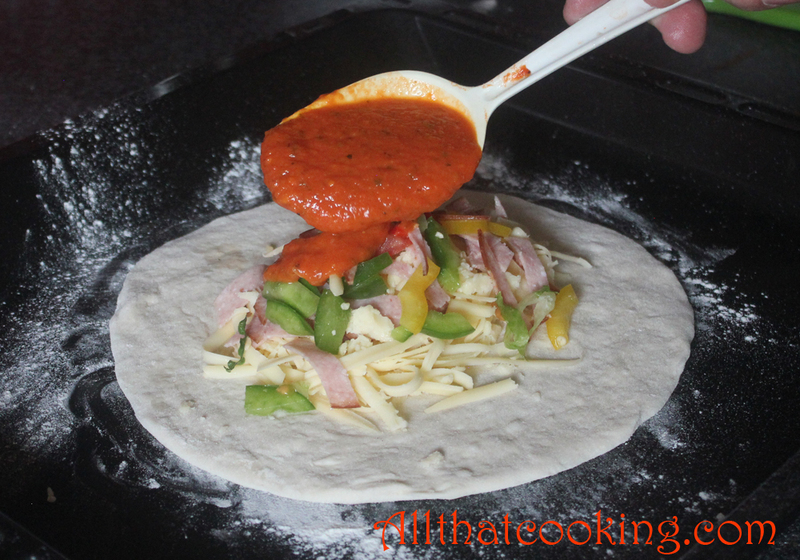 Oli used cheese, peppers, ham and some pizza sauce to finish it off, but you can be as creative as you like. Got left overs? Great way to use them up. We’ve got one more pizza post coming up, then maybe we’ll switch gears and do something from, let’s see. . . how about Poland? I’m off to visit friends and celebrate a family wedding in Rzeszow. Travel, friends, family, and food – can’t get better than that. This recipe makes one calzone. Double, triple or quadruple it to make 2, 3 or 4. While calzone is in the oven mix 2 cloves grated garlic into 1/4 cup oil. Reserve. 1. 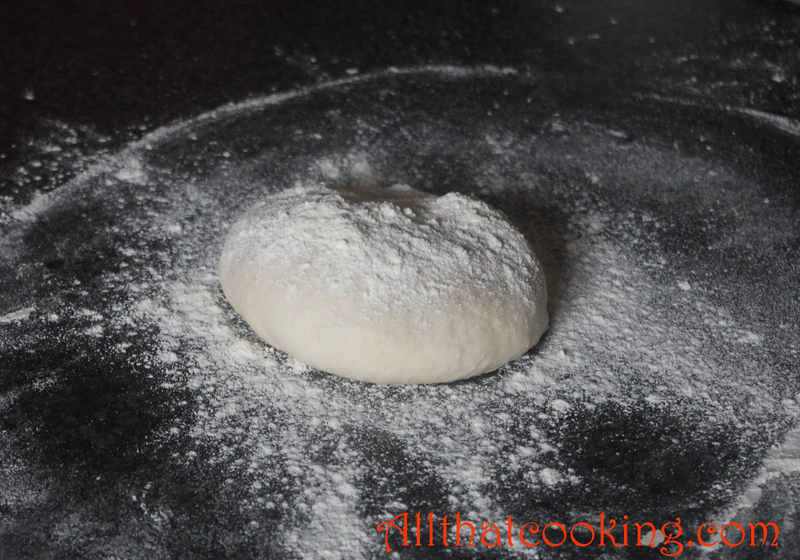 Dust dough with flour and place it on a flour-dusted work surface. 2. 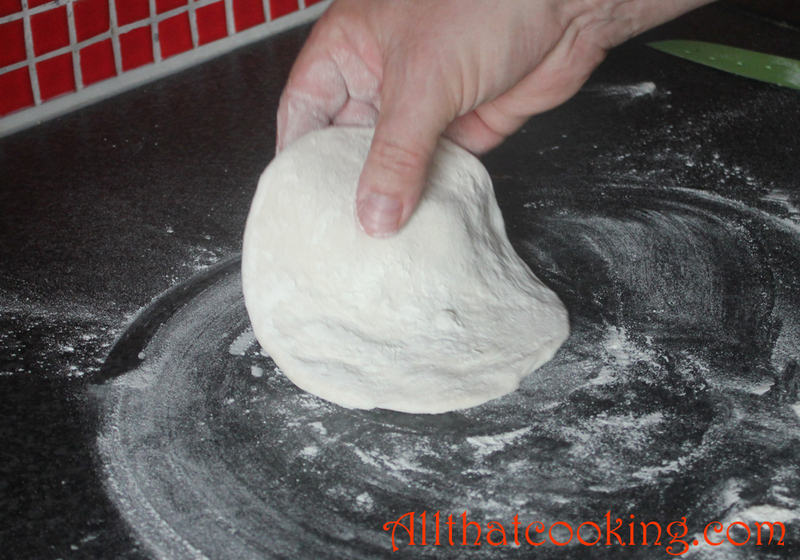 Use your fingers to evenly press down the dough. Even out the sides as you go. 3. Flip the dough over and do the same thing. 4. 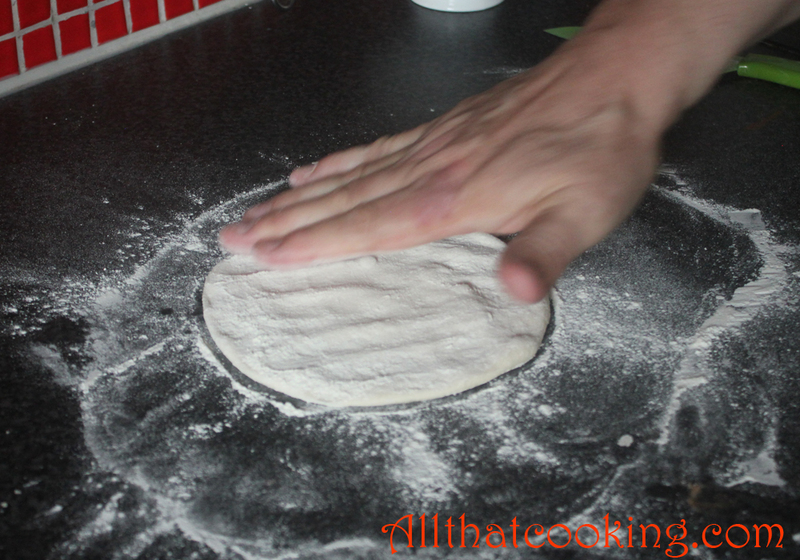 Use both hands to evenly stretch the dough to about a 10-inch round. 5. 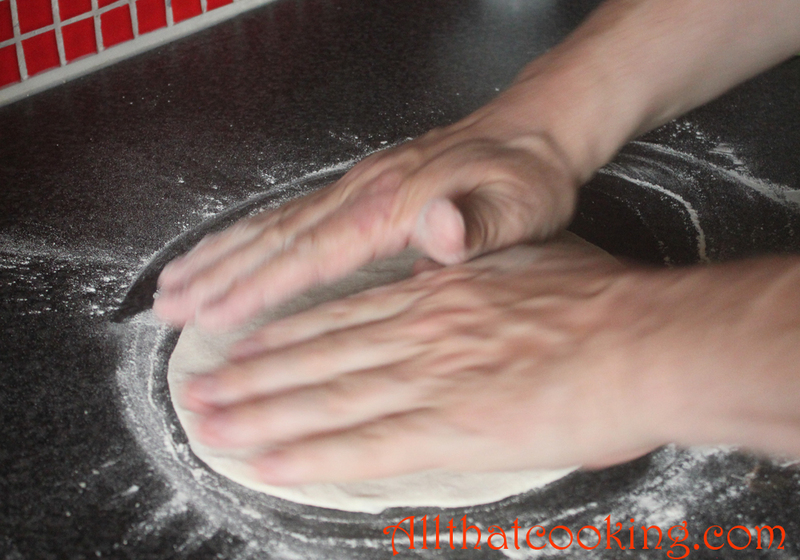 Place dough round on a floured baking tray. 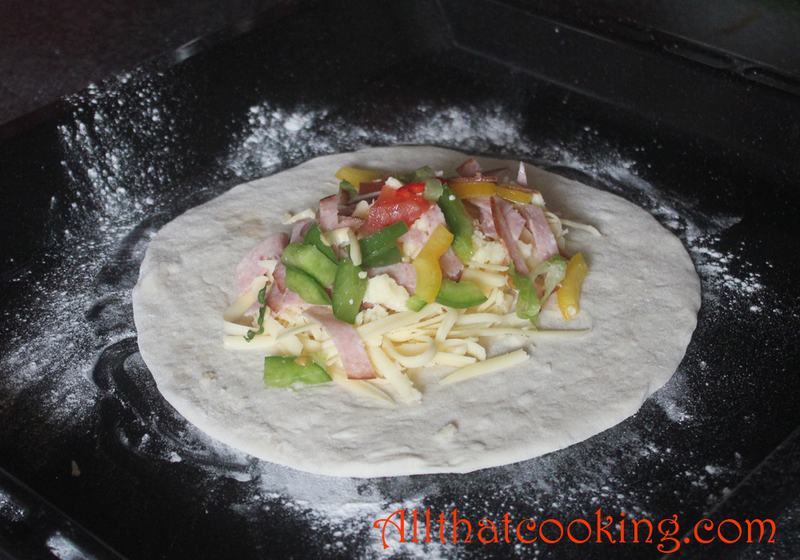 Sprinkle cheese in the middle of the round, then top with peppers and ham. 6. Spoon sauce over the filling. Keep away from the sides of the dough. 7. 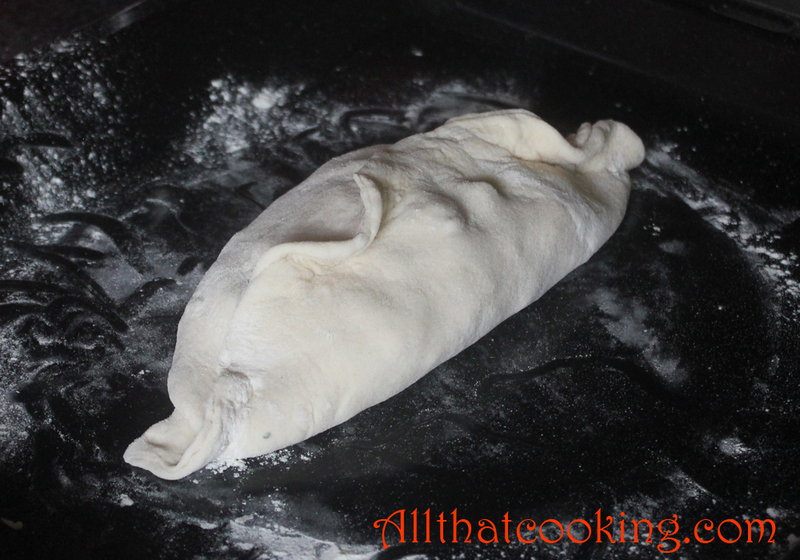 Carefully make a turnover by folding one side of the dough over the filling. Press the edges together and be sure there are no openings. 8. 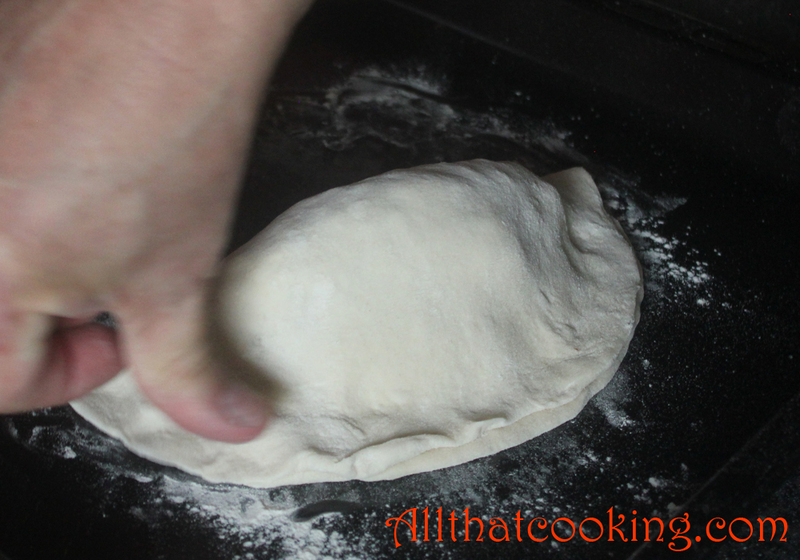 After you have pressed the sides together, turn the calzone so that the seam is now on top. 9. Bake in preheated oven for about 10 minutes, or until crust is golden. 10. Give the garlic oil a quick stir, remove calzone from oven and immediately brush with the garlic oil. Try a nice Sangiovese or a Lodi Zin to accompany your creation. Gallery | This entry was posted in Calzones, Main Dishes, Pizza, Pizza Sauce and tagged calzone, pizza calzone, pizza dough, pizza sauce. Bookmark the permalink. 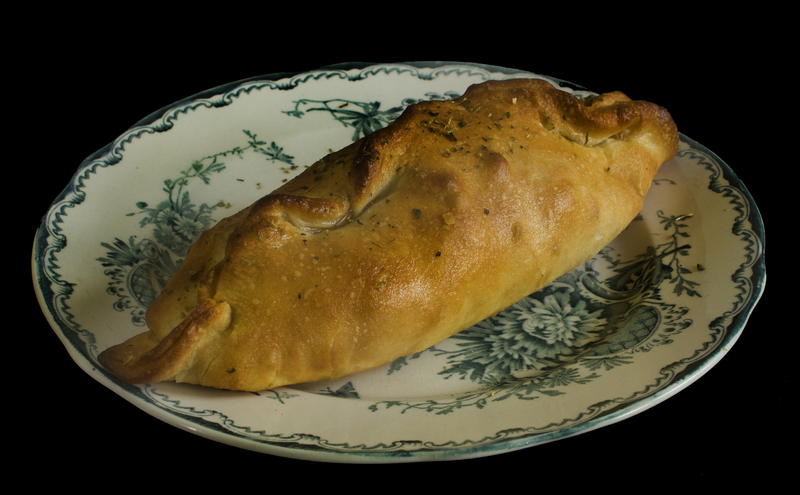 i succeeded in making the “Calzone” today and my wife said it was delicious and i danced “Gangman Style” afterwards. it is a elction day here in Reykjavik, municipal election and a new mayor will be elected so it is very appropiate to have Calzone (Vasi in Icelandic) but i hope he will not use my “Calzone”.I Iook forward to the Polish pizza because i know some Polis folks here in Reykjavik and i like their sausages very much. You are a trip! Always love your comments and feed back. Wish I could have seen you dance 🙂 As for Polish pizza, I will certainly look for a pizza place in Rzeszow. Never thought about putting kielbasa on pizza, but why not? i dont know about the “Gangman Style” dance, it has been raining here in Reykjavik since i danced. The Calzone was good, but next time i make it i will blend the the stuffing ingredients better for inst. Er þetta það sama og þú varst með á pizza plús, minnir að það hafi heitið Fugazzia ? Nei, þetta er ekki sama. 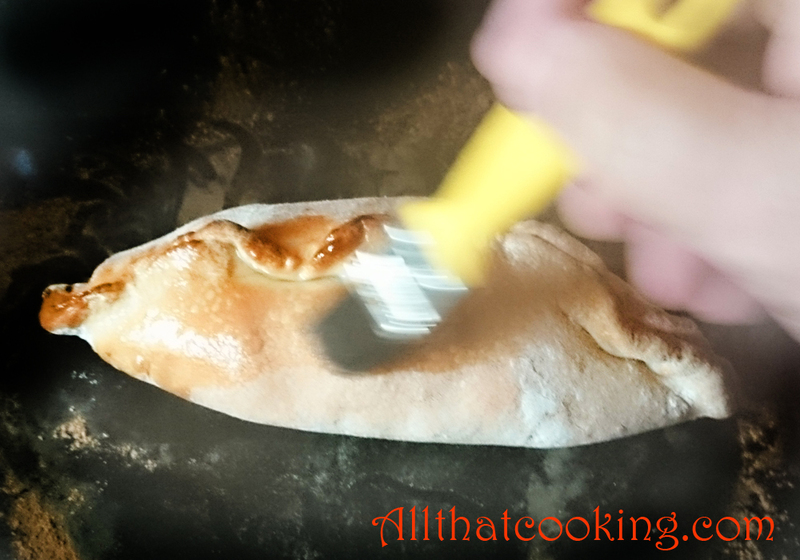 Calzone er inbökuð pizza ! !